The Scythians were a large group of loosely connected people who lived in Russia. They also lived further south around the Black Sea and the Caspian Sea. Like the Hittites, the Greeks and the Germans, they were Indo-Europeans. We don’t know when the Scythians first formed a group. But by 600 BC they were certainly already well established. They took over some of the land to their south (modern Turkey) for a while. The Medes pushed the Scythians back to the Black Sea again, and after the establishment of the Persian Empire, about 500 BC, the Persian king Darius fought another campaign against the Scythians in the Black Sea area. But this time the Persians lost, and the Scythians kept on living around the Black Sea. 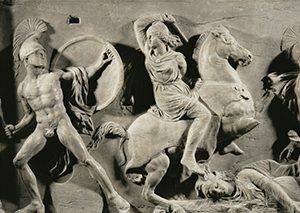 Maybe inspired by the success of the Parthians in invading Iran, the Scythians also began attacking people south of them, and about 150 BC they conquered the Sogdians (in what is now Afghanistan). As military leaders of the Sogdian traders, the Scythians got very rich from Silk Road trade. The Scythians kept control of the northern Silk Road routes until around 200 AD, when another very similar group, the Sarmatians, overran them and took over their territory, and control of the Silk Road. But soon after that, beginning about 300 AD, the Indo-Europeans in Central Asia began to lose ground to Turkic and Mongol speakers like the White Huns. Although descendants of the Scythians and the Sarmatians still live in that area (modern Georgia and Ukraine) today, by 1500 AD the rulers of Central Asia were Turks and Mongols. A lot of what we know about the Scythians comes from the Greek historian Herodotus. He wrote a long description of Scythian religious rituals, lifestyles, and principles as part of his history of the Persian Wars. Herodotus wrote in the 400s BC. Herodotus tells us that the Scythians liked to make drinking cups out of the skulls of their enemies. But Herodotus is trying to show how the Greeks are more civilized than the barbarians (which explains why the Greeks won the Persian Wars). So he naturally tends to emphasize the Scythians’ bloodiest traditions. He also tells us a lot of more ordinary stuff: Scythians were afraid of the water but they liked saunas; they carried cups hooked on their belts; they liked to inhale marijuana smoke, and Scythian women sometimes fought in their wars. Beyond Celts, Germans, and Scythians: Archaeology and Identity in Iron Age Europe, by Peter Wells (2001). A short discussion of the problems with labelling other people “Scythians” and so on – what does that mean? 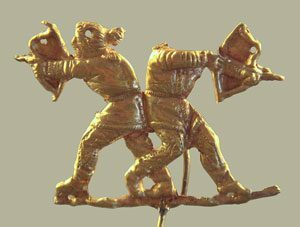 Is anyone really a “Scythian”? Raises a lot of good questions. Scythians and Greeks: Cultural Interaction in Scythia, Athens, and the Early Roman Empire, by David Braund and others (2004). Tries to answer some of these questions, with essays by a number of different specialists including some who are themselves from Ukraine and Georgia. The First Horsemen, by Frank Trippett (1974). A Time Life book, now pretty out of date. Cite this page: Carr, K.E. 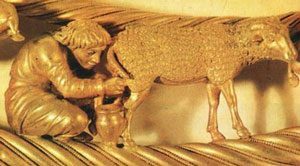 Who were the Scythians? Central Asian history. Quatr.us Study Guides, September 14, 2017. Web. April 25, 2019.